future reductions, and lead to the development of training programs to counter the challenges. of the psychological contract of lifetime employment. tive” (Lesser & Prusak, 2001: p. 101). to be a culture that embraces an ideal that knowledge is power. management in recently downsized organizations. syndrome (Baruch & Hind, 1999). edge power and actual knowledge sharing behavior? 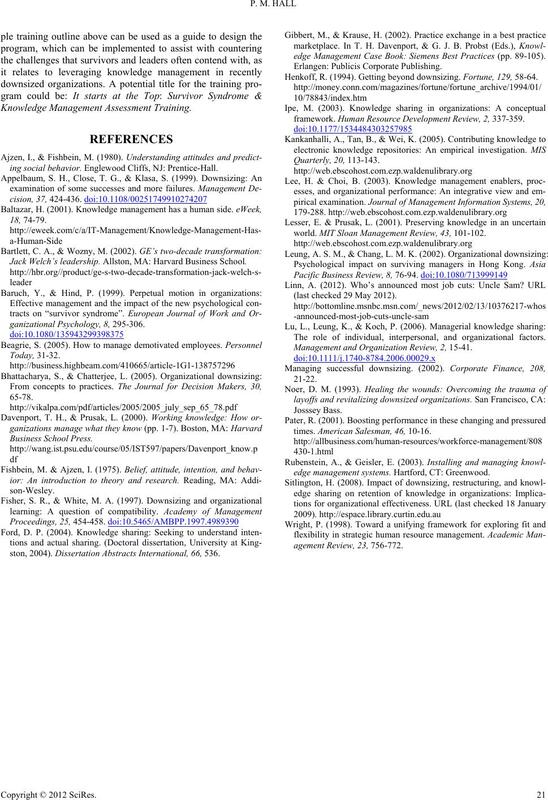 knowledge power and actual knowledge sharing behavior. correlation statistics were computed as well. vor syndrome and actual knowledge sharing behavior? ior. Table 1 displays the correlation results and p-value. displays the correlation results and p-value. 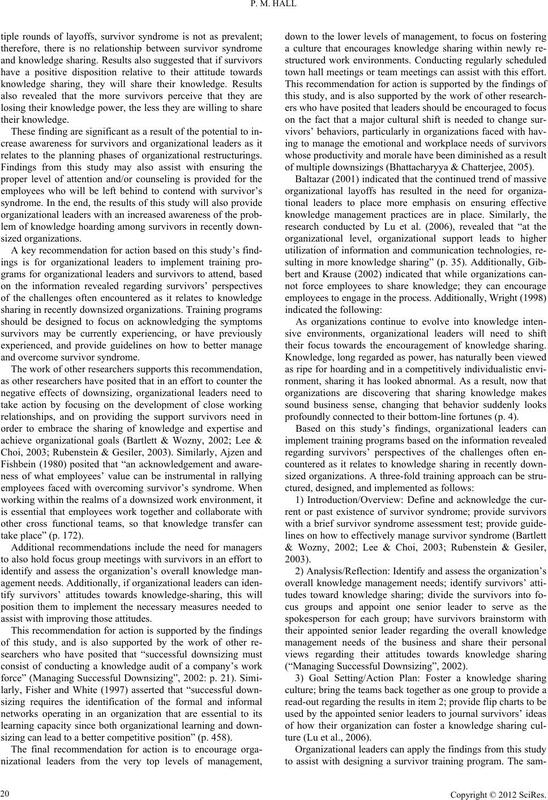 of knowledge power and actual knowledge sharing behavior. Imtercorrelations among the summated scale scores (N = 37). Note: *p < .10. **p < .05. ***p < .01. ***p < .005. *****p < .001.
meaning information is only shared, on a need-to-know basis. throughout an organization (Rubenstein & Geisler, 2003). 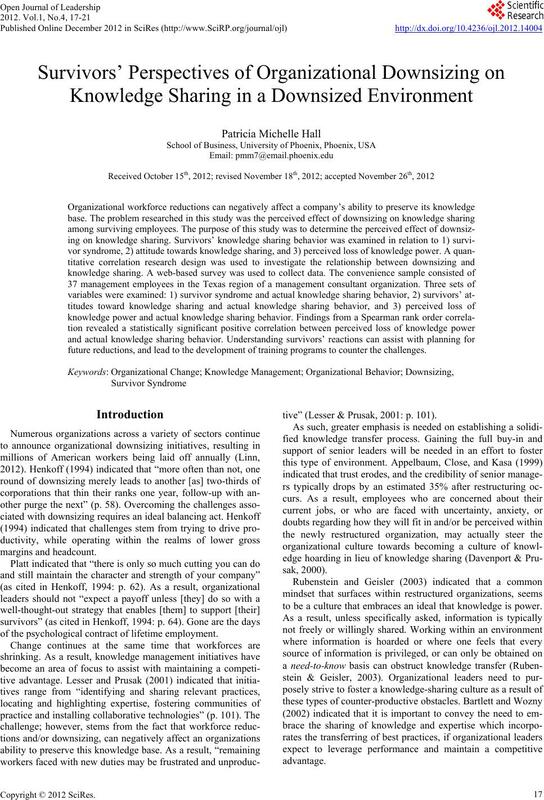 knowledge sharing and actual knowledge sharing behavior. relates to the planning phases of organizational restructurings. assist with improving those attitudes. sizing can lead to a better competitive position” (p. 458). town hall meetings or team meetings can assist with this effort. of multiple downsizings (Bhattacharyya & Chatterjee, 2005). their focus towards the encouragement of knowledge sharing. profoundly connected to their bottom-line fortunes (p. 4). ture (Lu et al., 2006). ing social behavior. Englewood Cliffs, NJ: Prentice-Hall. Jack Welch’s leadership. Allston, MA: Harvard Business School. ston, 2004). Dissertation Abstracts I nternational, 66, 536.
edge Management Case Book: Siemens Best Practices (pp. 89-105). Henkoff, R. (1994). Getting beyond downsizing. Fortune, 129, 58-64.
framework. Human Resource D evelopment Review, 2, 337-359.
world. MIT Sloan Management Revie w, 43, 101-102. (last checked 29 May 2012). The role of individual, interpersonal, and organizational factors. Management and Organization Review, 2, 15-41.
times. American Salesman, 46, 10-16.
edge management systems. Hartford, CT: Greenwood.